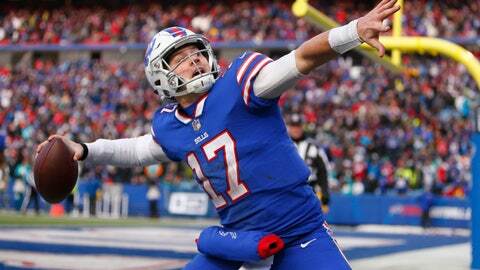 ORCHARD PARK, N.Y. (AP) — Josh Allen took it upon himself to be the Buffalo Bills‘ one-man welcoming committee in sending a text to each of the team’s numerous free agent additions last month. For Allen, it was the second-year player’s first real opportunity to begin putting names to the many new faces Buffalo added in essentially revamping its entire offense. Of the Bills’ 17 veteran free agents signed this offseason, 11 play offensive positions. It’s a group that includes established receivers Cole Beasley and John Brown, tight end Tyler Kroft, and running back Frank Gore. Beasley and Brown join a bunch of receivers that lacked experience and a proven threat, while Gore will be teamed with LeSean McCoy in a backfield featuring two players over 31. The remaining seven are offensive linemen, including center Mitch Morse, in Buffalo’s bid to upgrade what had been a patchwork unit a year ago. Aside from Allen leading the team with 631 yards rushing, Buffalo ground attack sputtered, and the line had difficulty in pass protection. The Bills are hoping the newcomers spur a dramatic improvement and play a role in continuing Allen’s development after he showed signs of improvement as last season progressed. The first-round draft pick initially struggled when being thrust into the starting role after Nathan Peterman unraveled in a season-opening 47-3 loss at Baltimore. The first thing Allen learned was Morse isn’t big on spicy chicken wings. NOTES: Allen said his right elbow feels fine, and added he spent a few weeks working with a physical therapist this offseason. … The offseason program coincides with the Bills opening their newly built two-floor, $18-million workout facility added on to their practice fieldhouse. “It’s amazing. I think it speaks for itself,” linebacker Tremaine Edmunds said. “The owners really did pretty much what we could ask for.”… The Bills will hold their first on-field team practice on May 20.